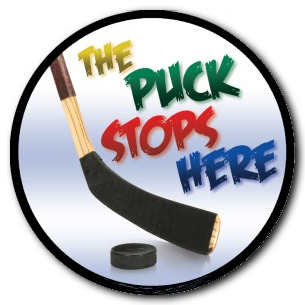 Purchase our Magnetic Ice Hockey Car Magnet with the the theme "THE PUCK STOPS HERE". This 4 7/8 inch round Ice Hockey magnet is manufactured and printed in the USA. We print on premium quality, super-thick (.030) magnetic material with top quality, UV protected inks. I got two of these for my late son's two children, our grandchildren. They will be proud to display them on their cars. Nice logo and they stick well.